For color-coding CoolRack tube modules. Colorful elastic sleeves brighten your lab and allow you to color-code your experiments, while providing a comfortable grip when handling cold , warm or wet CoolRack tube modules. Compatible with ice, dry ice and water baths. Sleeves fit the following modules: All 15-well CoolRack modules All 30-well CoolRack modules CoolRack 15ml CoolRack 50ml CoolRack VS13 CoolRack V13 CoolRack V16 Four colors: purple, green, orange, pink Pack of 4, one of each color. Height extender for use with tall tubes. Use a CoolBox XT Extension Collar when keeping tall tubes such as 3, 4, or 5 mL cryovials, 15 mL or 50 mL centrifuge tubes and blood collection tubes in the CoolBox XT ice-free cooling workstation. Place in between the the base of the CoolBox XT system and the original collar. Magnets on top and bottom provide a secure connection to the base and original collar. Height extender for use with tall tubes. Use a CoolBox 2XT Extension Collar when keeping tall tubes such as 3, 4, or 5 mL cryovials, 15 mL or 50 mL centrifuge tubes and blood collection tubes in the CoolBox 2XT ice-free cooling workstation. Place in between the the base of the CoolBox 2XT system and the original collar. Magnets on top and bottom provide a secure connection to the base and original collar. 0.5 to 4℃ cooling cartridge, blue, 3 per pack. Freeze cooling cartridge in a -20℃ freezer until frozen, then place in CoolBox 30 base. Place pre-chilled CoolRack tube module of choice on the cartridge. Samples stay cold (0.5 to 4℃) on the bench for up to 10 hours with lid on, 6 hours with lid off. All samples have identical cooling profiles regardless of well position. Re-usable and highly durable. 3 per pack. Made in USA. -20 to 0℃ freezing cartridge, green, 3 per pack. Freeze cartridge in a -20℃ freezer until frozen, then place in CoolBox 30 base. Place pre-chilled CoolRack tube module of choice on the cartridge. Samples stay frozen (-20 to 0℃) on the bench for up to 6 hours with lid on, 4 hours with lid off. All samples have identical cooling profiles regardless of well position. Re-usable and highly durable. 3 per pack. Made in USA. Cooling cartridge (0.5 to 4℃) for CoolBox XT, CoolBox 2XT and XT Starter. Re-usable XT Cooling Core for use in CoolBox XT System, CoolBox 2XT System and XT Starter ice-free cooler. In CoolBox XT and CoolBox 2XT Systems, the XT Cooling Core provides over 16 hours of 0.5 to 4℃ cooling with lid on and over 10 hours with lid off. In XT Starter cooling system, XT Cooling Core provides over 4 hours of 2°C cooling to all samples. Pre-freeze in a -20℃ freezer until frozen, then place in CoolBox XT, CoolBox 2XT or XT Starter when ready to work. One Each. Made in USA. Low profile, open platform ice-free cooler that keeps samples at a uniform 2°C for over 4 hours - without ice, batteries or electricity. XT Starter accommodates most CoolRack and CoolSink sample modules, making it a versatile and flexible tool for a variety of applications. The low profile and small footprint make it ideal for use in the hood especially in keeping temperature sensitive solutions (e.g cryopreservatives, media, reagents etc) cold. The built-in 1-8º C Temperature Indicator provides visual assurance of operational temperature while working. XT Starter includes one XT Holder base and one XT Cooling Core. To extend the cooling duration, keep an additional XT Cooling Core in the freezer and replace the Core as needed. To assemble, simply pre-freeze the XT Cooling Core in a -20°C cooler until frozen. When ready to use, rest the XT Cooling Core on the bench until the Temperature Indicator registers 1°C (approximately 10 minutes). Then insert the XT Cooling Core into the XT Holder and place a CoolRack or CoolSink sample module on top. Made in USA. CoolBox 30 System eliminates the risk of ice contamination and provides hours of ice-free cooling or freezing to a variety of laboratory tubes with consistent and uniform well-to-well temperature. Each system comes with a highly insulative and durable high-density polyethylene base and lid, and one cooling cartridge that is comprised of a phase-change solution in a thermo-conductive housing. Available in purple. Insert one of a variety of CoolRack tube modules into CoolBox 30 for uniform and consistent well-to-well temperature. Order sample module separately (see below). • +0.5℃ to 4℃: Use blue cooling cartridge to keep samples cold for up to six hours with lid off, up to 10 hours with lid on. • -18℃ to -10℃: Use green freezing cartridge to keep samples frozen for up to four hours with lid off, up to 6 hours with lid on. • -30℃ to -25℃: Place dry ice in the bottom of CoolBox 30 base. Cover the dry ice with the insulator pad and rest CoolRack tube module on the insulator pad for up to 5 hours of freezing. • CoolBox 30 is compatible with dry ice and liquid nitrogen and either may be used in place of the cooling cartridge to provide ultra-low cooling (snap freezing) to a variety of tubes. • Optional Freezing Cartridge: Use the optional CoolBox 30 Freezing Cartridge to maintain frozen samples between -20℃ to 0℃. 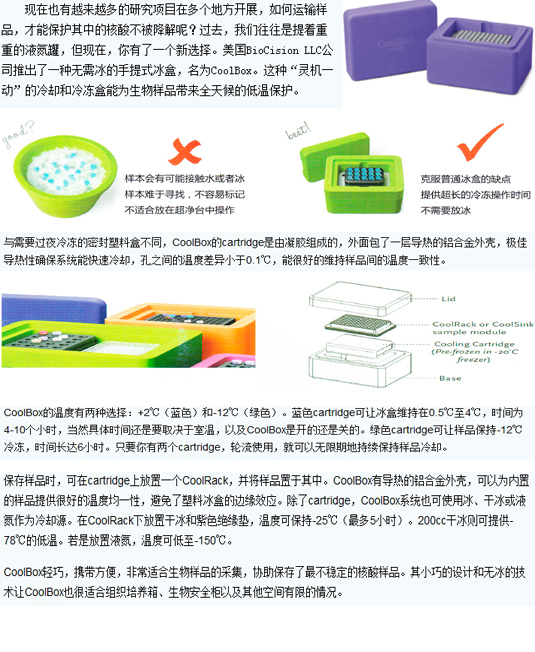 CoolBox 30, cooling cartridge and insulator pad may be cleaned with alcohol or common laboratory detergents. Internal freezing cartridge (-20 to 0℃ or -80 to 0℃) for CoolBox XT and CoolBox 2XT. Re-usable XT Freezing Core for use in CoolBox XT and CoolBox 2XT Systems. Provides over 8 hours of below 0℃ freezing with CoolBox XT lid on and over 5 hours with lid off. Pre-freeze in a -20℃ or -80℃ freezer until frozen, then place in CoolBox XT base when ready to work. CoolBox XT holds one XT Freezing Core. CoolBox 2XT holds two XT Freezing Cores. One Each. Made in USA.